Age: 2 yrs old approx. * one day a young girl floats down from the sky using an umbrella and Serena’s mother thinks that she is her daughter. * She cannot say a lot in fact most of her words are either "Chibi" or "Sweets"
* Chibi Chibi also does not dislike Serena; she shares a lot in common with her instead. Like they both like sweets and a sisterly bond with each other! Luna = She is a black cat with red eyes (though in her human from she has blue eyes), and she have a yellow crescent moon on her forehead. Luna First meets Usagi, when Usagi saves her from being tortured by little brats. 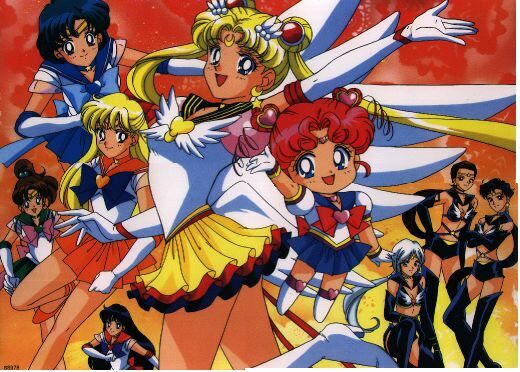 She helps Usagi to find the other four Sailor Scouts and tells Usagi that her mission is to find their princess and to defeat the Dark Kingdom. Luna falls in love with a human, Kakeru, but is unable to express her love because she is a cat. (Luna transforms into a young, pretty girl and poses as the Princess Kaguya in order to help Kakeru).Luna is generally serious and helps keep the Senshi, especially Usagi, on track. She aptly described as Usagi’s guardian and mentor. She teases Artemis a lot, and she develops crushes on human men, like namely Kakeru and Yaten. Artemis = He is a male white cat. 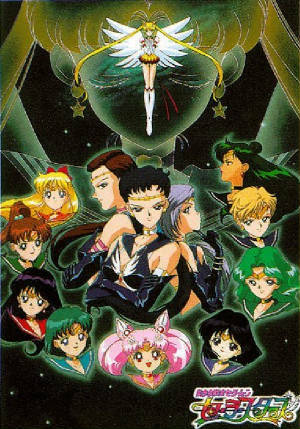 Artemis first finds Minako Aino and he gives her the power to become Sailor V. They meet up with the other Sailor Senshi in Tokyo and Sailor V becomes Sailor Venus. Luna likes to make fun of him constantly. However, he still loves her. He becomes incredibly jealous and get hurt when he realizes that she has a crush on someone else. However, in the end they always make up. Diana = She is the daughter of Luna and Artemis. She is a kitten. Her coat varies from being grey to pink. Diana is very cute. 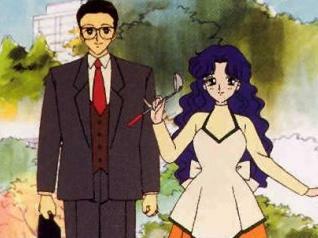 Her habits are calling Mamoru "Mamoru-sama" and Usagi "Usagi-sama" as they were in the future as the king and queen of Crystal Tokyo. 3. Helios / Pegasus = Chibi-Usa's lover; Friends of the Sailor Senshi's; From the planet Ellison; He is the prince of Ellison; He only appears in children's dreams; He also turn into a Pegasus. 4. 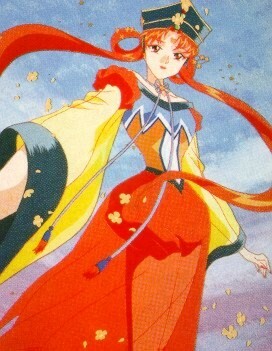 Princess Kakyuu = Princess Kakyuu is the princess of the Sailor Starlights. The Starlights came to Earth to find her. 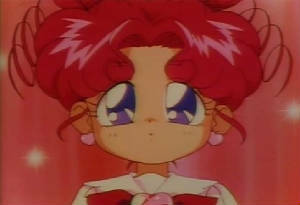 Chibi Chibi is the one who helped Princess Kakyuu to find Earth, using the chalice and caring for it. 6. Peruru = He only appears in SM Super S: Movie; sugar fairie that becomes friends with Chibi-Usa; He used to worked with Madame Vadiane but after he saw what she was doing on Earth. He decided to help the Sailor Scouts. * Kenji- Usagi's father; He is a magazine editor. * Ikuko- Usagi's Mother; She is a housewife who stays at home most of the time. Ikuko also has a tendency to get brainwashed by cute little girls. *Shingo / Sammy- Usagi's younger brother; He don't like cat due to a bad experience when he was a baby but Sailor Moon persuaded him in likely Luna. 2. Grandpa Hino = Rei's Grandfather; He is a perverted old man. 3. Professor Tomoe = Hotaru's father; He is a regular professor of chemistry, until Pharaoh 90 bargains with him to save his daugther's life. 4. Queen Serenity = Real Mother of Usagi; Past ruler of Crystal Tokyo and the Moon Kingdom; She died by saving her people and her kin from the Moon Kingdom and Crystal Tokyo. 5. Osaka-san (Molly’s Mother) = Naru's Mother; She owns a jewelry shop and was turned into a youma before. * She is a single child living with her mother who owns a jewelry store. *Her hair is short, curly, and red with a bowtie in the back. 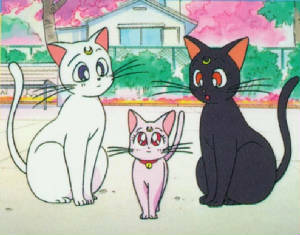 * Usagi's think highly of her and she is always saying that she is very smart. 3. Motoki Furuhata (Andrew) = Friend of Darien; He runs the arcade that Usagi often visits; His' girlfriend name is Reika / Rita (she is an Archeologist); Both Usagi and Makotohad crushes on him. * Sakurada is Usagi's, Umino's, and Naru's English teacher for the eight grade. * She is kinda young for being a teacher. * Sakurada seems to only punish Usagi about her poor grades and also, for being late to her class. 6. Reika Nishimura ( Motoki’s girlfriend, Rita) = She is Motoki's Girlfriend; Reika likes minerals and is very kind, friendly and polite to others; She is an Archeologist. 7. Unazuki Furuhata (Motoki’s Sister, Elizabeth) = Motoki's Sister; She works in the Crown Fruit Parlor as a waitress; She is also older than Usagi. 8. Momoko Momohara (Chibi-Usa’s Best friend) = She always hangs with Chibi-Usa; She is the girl with purple hair that is seen always talking to Chibi-Usa. 9. Kyusuke Sarashina = One of Chibi-Usa’s friend; young male, looks a lot like Shingo, (Usagi's brother), but with lighter hair. 11. Himeko Nayotake ( Kakeru’s girlfriend, SM S: Movie) = Kakeru's Girlfriend; Childhood friend of Kakeru's who wants to be an astronaut. 12. Yuuichiro ( Chad, Rei’s Boyfriend) = Rei's boyfriend; He had a major crush on Rei before she even notice him; He was employed by Rei's grandfather to work at Rei's Shrine.